Haruna Shrine (榛名神社) is one of the oldest shrine located in Gunma Prefecture. It is one of three major shrines of Gunma and established in 586. This shrine located in the rocky valley with sacred atmosphere. There are many old buildings that registered as the national historical assets. The main deities of Haruna shrine are the god of fire and the god of earth. It's been highly respected by many rulers of this region, even today. 1. use local bus to Harunajinja. According to the legend, Haruna Shrine was established during the regin of Emperor Suizei (581 - 549 B.C.E.). When the deity Nigihayahi and his son. Umashimade, built an altar on Mt. Haruna to worship the gods of heaven and earth. A shrine to conduct Shinto titles was constructed in 586, nearly a thousand years later during the first year of the ear of Emperor Yomei. In 927, a historical list of shrines in Japan was completed, and Haruna Shrine was listed as one of the tweleve shrines of Gunma Prefecture. Haruna Shrine has long embraced a syncretic fusion of Shintoism and Buddhism, as exemplified by ruins of its ground dating back to the ninth century identified as living quarers for Buddhism priests. in Documents addressed to the authorities in 1190, the grounds of Haruna's Buddhists temple were described as a spiritual place develeped to prayers for a tranquil nation and a sacred and eternal home for deities; a place of refuge where neither strong men nor the police were allowed. It was also a shelter for those in need. During the middle ages of Japan, it was designated as the 6th most important shrine and many feudeal lords of Gunma tried to fight for its supremacy. Especially, Muromachi government donated many buildings and lands to this shrine. In war period, many feudal lords respected this shrine and worshiped. In Meiji era, the part of Buddhism was separated and became shirne. 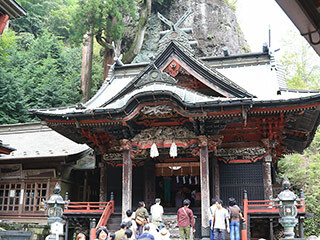 Today, there are many traditional buildings remaining and many people still worship here. It was used to be Niomon Gate. When it became shrine, people donated the Zuishin Statues in 1906. Constructed in 1847. Constructed in 1869. Only remaining traditional pagoda in Gunma Prefecture. The tallest Cedar in this shrine. During the Sengoku Period (War Period), the famous Daimyo, Takeda Shingen, release the arrow to wish the victory. Constructed in 1859. The hall for Mikoshi. It is registered as the national important caltural asset. Constructed in 1855. It is registered as the national important caltural asset. It has a beautiful carving arts of dragons. Constructed in 1806. It has magnificent carving arts. It is registered as the national important caltural asset. Consructed in 1728. It is registered as the national important caltural asset. Represents the god of this shrine. Constructed in early 18th century. Built in 1323 by Nitta Yoshisada.